Pictured from left to right, are: Warren Goode, Pishral Kailwan Mina, Peter Staines (standing) and Javid Iqbal. 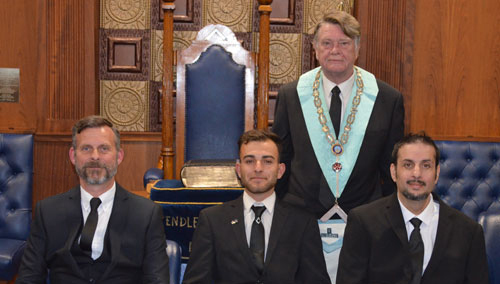 The lodge was consecrated on 3 May 1968 and to mark the anniversary the lodge was attended by APrGM Dave Walmsley, Alex Neilson PAGDC, John Hutton PAPrGM and Eccles Group Vice Chairman Patrick Walsh (both John and Patrick are members of Pendlebury Lodge). Dave Walmsley was welcomed into the lodge by WM Peter Staines who duly offered the gavel to Dave who thanked him and swiftly returned it. The main business on the summons was to initiate Warren Goode. Warren was guided round the lodge by the junior deacon Len Heathcote. The ceremony was performed with dignity and sincerity by Peter Staines and John Hutton under the careful scrutiny of DC Paul Newton. The first degree tools were presented by Keith Morris and the first degree charge by Paul Newton. Pictured standing from left to right, are: Javid Iqbal, Craig Russell, Warren Goode, Pishrad Kailwan Mina, Len Heathcote, Paul Newton, Keith Charman and Trevor Dickenson. Seated from left to right, are: Keith Morris, Peter Staines, Patrick Walsh and John Hutton. The newly initiated brother, Warren, was the third new member to join Pendlebury Lodge within seven months. Pishral Kailwan Mina was initiated in November 2017 and Javid Iqbal in January 2018 which bodes well for the future of the lodge. On conclusion of the meeting the brethren retired to share a splendid carvery meal together to mark a wonderful double celebration. To mark the occasion of 50 years, the brethren were presented with a booklet which had been arranged by John Hutton. Pictured seated from left to right, are: Dave Walmsley, Peter Staines, John Hutton and Alex Neilson along with brethren and visitors.